The dancer and artist Eiko Otake is known for her series “A Body in Places,” in which each performance highlights Otake’s body in a space — a bus station, museum, Wall Street, Fukushima’s no-entry zone — in which it doesn’t quite belong. Otake’s subtle movements draw attention to the space itself and to her outsider’s body. 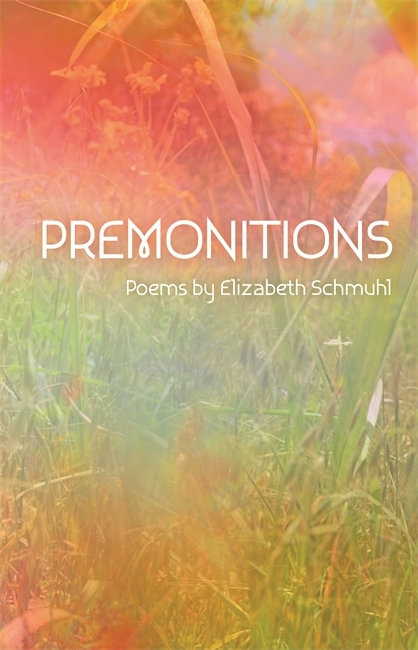 Premonitions (Wayne State University Press, 2018), Elizabeth Schmuhl’s new book of poems, could just as well be subtitled “A Body in an Orchard,” as it is a collection that delves into the speaker’s body and her physical and emotional journey through environmental spaces — particularly a Midwestern fruit farm. In these poems, there’s no single way to be alive — every movement, every dream, every color, every stillness, every rebirth, every act of destruction, every living thing surrounding the speaker is a reminder of that vitality. To Schmuhl, everything is worth exploring, questioning, noticing; even if we don’t quite understand how or why. A graduate of University of Michigan’s Residential College, Schmuhl’s work has been published in The Rumpus, Paper Darts, PANK, Hobart, and Pinwheel, among other publications. Poems from the collection, titled “#90” and “103,” first appeared in the Winter 2018 issue of Michigan Quarterly Review. Schmuhl and I chatted over email about her family’s fruit farm, the connotation of “premonitions,” synesthesia, and more. Images of barns, summer fruit, and harvest moons blossom on every page in your new collection of poems, Premonitions. You are the daughter of a third-generation fruit farmer and I know you’ve spent much of your life on your family’s orchard near Michigan’s Paw Paw River. This book then serves as a kind of homage to the fruit farm of your past. After years working in urban centers like New York, DC, and Chicago, what keeps you coming back to this particular piece of Earth? 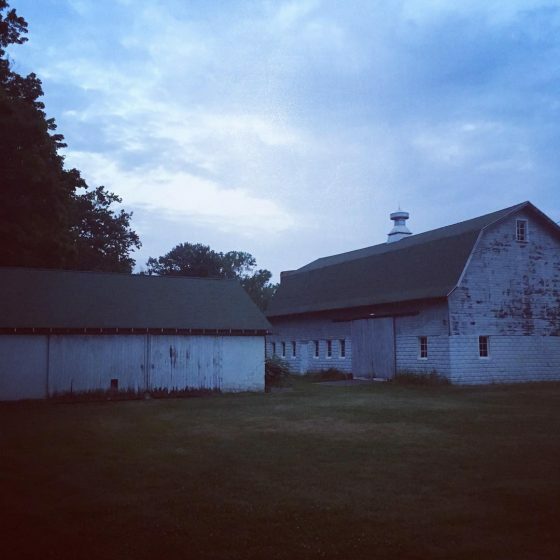 Why must you write about the farm? No matter where I’ve been, the farm has always been there. It’s my anchor. My father sacrificed a lot to keep it, and I grew up watching how that sacrifice manifested. There’s so much to learn there, both about the world and myself. It’s a type of gateway for me; a portal I can enter, even when I’m not physically there, to reflect, analyze, dream. I also think it provides a nice counter to all of the time I’ve spent in cities. I love the energy of New York, but I also crave the solitude I find at the farm. When I live in a city, I often try to find places to visit on the weekend. In D.C. I would go to Shenandoah or smaller parks in Maryland. The farm has always been in my life; to not write about it or be influenced by it would deny an integral part of my being and who I am. How has your relationship with the farm changed over the course of your life? Did it change while writing this book? It’s both changed and stayed constant. It’s the one place that has always felt like home. I think having it fill that role has allowed me to wander. No matter where I am, I know the farm is waiting for me and because of this, I’m not afraid to leave or live other places. I know this has the opposite effect on some people but I’m drawn to movement. I think as I grow older, I have a different sense of how important the farm is to me. Most recently, this has been making me want to share it with others. I’ve already started having small artist residencies on the farm, and I plan to do more things like this in the future. My parents definitely instilled the idea that it’s better to give than keep. We’re always giving away produce, having people spend the night, etc. My mother often says “We’re the farm’s caretakers, for now,” and I definitely agree with that sentiment. When did you first begin working on Premonitions? Did the arc or themes of the collection shift from your initial vision of it? If so, how? I started working on it when I was teaching writing in the Residential College at the University of Michigan. Since I was in Ann Arbor, it was easy to get to the farm (it’s roughly two hours away) and I would. I wrote the poems because I had to, but I did push myself to not hold back. “Write the poems that scare you,” someone once said to me, and I feel like I did that in this collection. There’s beauty, but there’s also ugliness in the collection, and I like that it encompasses both. So if anything, I did embrace the darker side of the natural world throughout this collection’s evolution. I’m happy with the result. There are no titles in this collection. Instead, each poem is labeled numerically and each number is bathed in a colorful paint splotch. Could you speak a bit on the ways in which numbers and colors correspond throughout Premonitions? How does your synesthesia bleed into the pages? For me, numbers have moods/emotions connected to them as well as colors. For example, #134, the number 3 is always yellow, and 4 is red. 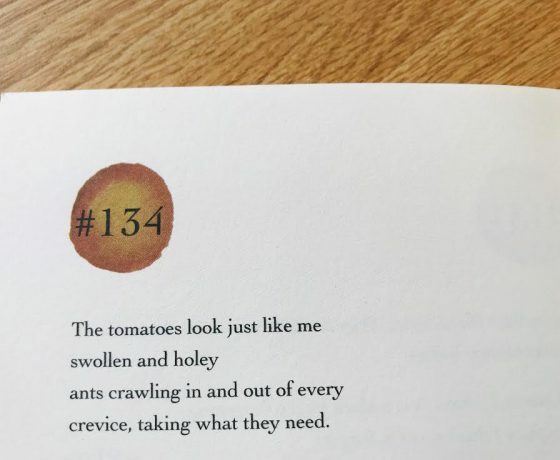 The poem encompasses imagery that supports that, I think, especially the idea of a tomato decomposing / being eaten. Also, the feeling of transformation is linked to the colors and numbers in this case for me. Do you know the colors of your poems before or after you’ve written them? That’s a great question! I think it worked in both ways while I was writing the collection. I have some numbers that have special meaning for me, and I wanted those to be included. #27 comes to mind and #22. Are there any poems that didn’t make it into the final version of the manuscript? For example, we jump from a poem entitled #59 to a poem entitled #61 to a poem, #64. Is there a #60, #62, and #63 elsewhere? Yes! There are many poems that did not make the collection. I am always writing, and so some of it gets scrapped. But the idea that some of the numbers are missing, that was intentional. I didn’t want all of the numbers to be present. I like the idea of things being incomplete; that you are only seeing a portion of what was written. I think this is true of almost all published works — people go through many versions, and that’s not always acknowledged in the final text. The missing poems are a nod to this. Additionally, I like the idea that the speaker of the poems is not giving the reader access to all of the writing. I think it says something about the speaker. I hope people pick up on that, too. As a multidisciplinary artist, you are both a writer and a dancer. How does one inform the other in your work, and particularly, in the making of this collection — a book which frequently shows the speaker dancing and moving through spaces? This poem is dedicated to Bobbi Jene Smith, who I’ve had the luck to study with and also interview. She is always doing something incredible and most recently, starred in Bobbi Jene, which everyone should definitely see. Bobbi teaches Gaga, the movement language of Ohad Naharin (she was in Batsheva for a decade), which I was first introduced to by Bobbi. In Gaga, the teacher talks to the students the entire class, giving instructions via imagist language. A lot of the images used in Gaga are present in this poem. I think it’s very hard for me to separate the dancer from the writer, as I am both. People have often commented how much the body appears in my poetry, and I’m always surprised by it! I guess I can’t help it. Movement is just another mode for me to learn, discover, and navigate life. 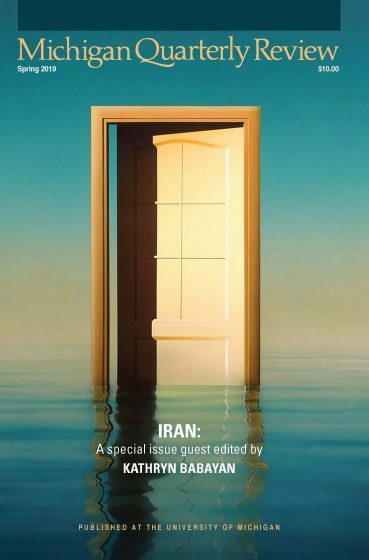 While the cover of the book is a vibrant, cheery rendering of healthy grass — cast in a summery glow of pink and green — the title “Premonitions” evokes a somber tone, a word which shadows each poem with a stormy tinge, a hint that fortune could turn at any moment. What fascinates you about the foreboding nature of premonitions, and how do you see your poems in conversation with that type of sensation or gut-knowledge? I wanted to expand the idea of premonitions because you’re right, most often, they are associated with the negative. But I think in these poems there is also light and beauty. So, such as in life, both are present in these poems. I also wanted to give nod to the women on my mother’s side, who often have premonitions that come true. I’ve experienced the same thing throughout my life, and continue to do so. An ex-partner once gave me a fortune cookie that reads, “Beware of the danger while things are going smoothly.” I’ve kept that slip of paper for over a decade, and I know it’s influenced these poems, too. One theme which the poems in Premonitions explore is the birth and death of many selves within a single body. Your poems imagine what happens to those selves when they escape our corporeal casing. For example, in #103, the speaker says, “In October I do not know which is which: / the iridescent hanging plum is my heart.” You ask the question, can our many selves survive in nature, separate from and outside of the body? Can we be reborn out of fruit and moonlight instead of blood and bone? Given this quest for self-discovery, it’s not surprising that every poem in this collection is spoken in a first person voice. When you begin a poem, do you envision each first-person speaker as yourself today, as a stand-in figure representing you, or as a projection of one of the many versions of yourself? In other words, who do you see when you write your poems, and who are you writing for? I’m a sucker for the first-person. I like the access it allows me as a writer and a reader, so it’s my preferred point of view from which to write. It just feels natural for me. I often remark to people that I can’t see myself or that they don’t really see me. This is because when people talk about my physical appearance, it feels as if they are talking to me about a stranger. So in terms of what the speaker looks like, I’m not entirely sure. I almost want to say, the speaker looks like everything/everyone. I want people to place themselves within the speaker’s mind, and not be too distracted by specific features, especially facial. The meat of a halved dove still beating and bloody. I’ve dreamed about her before. In the dream she didn’t look this delicious. What do you think we gain as humans by imagining these transgressive moments in the safe space of poetry? What does abjection allow you to work through, or process, on an emotional level? Poetry is so fun! I mean, I get really excited about it! It’s a genre that allows for great experimentation, of which I am definitely a fan. Poetry holds that space for us. As a dancer, I have the mindset of not being afraid to fail. In fact, in dance, you are almost always failing. We are often told in class, when a correction is given, that everyone should assume they are also making the error; you’re expected to apply every correction to yourself. I think this experience gave me the courage to be unafraid to fail and I bring that to my writing. In terms of being cast off, or working in liminal spaces, I’ve often felt that way in many assets of my life. Trinie, who you mention in your quote, was an incredible champion of allowing me to experiment. I worked with her for two semesters at VCFA, and I owe a lot of my bravery in writing to her. It can be lonely to work from a liminal space, but I think it allows me to go deeper, to uncover the unnameable, the wild. Even though it can be uncomfortable, I’m most comfortable working there. Your poem #7 starts: “I stopped using the internet years ago. All of the places I wanted to go weren’t there.” Where did you want to go then and where are you going next? I think I wanted to show that the speaker is in a different time/place than the readers of the poem might be. I was trying to transport them right away, to offer an alternative to our current reality, which is very much saturated with the internet. These lines came about because I do sometimes have the feeling that where I want to be isn’t accessible, or even an option. The internet to me has always felt like a place, and there are times I get exhausted by it. Where am I going next? I’m not entirely sure, but I’m open to all of the possibilities. I do know I will return to the farm. Hopefully others will too. 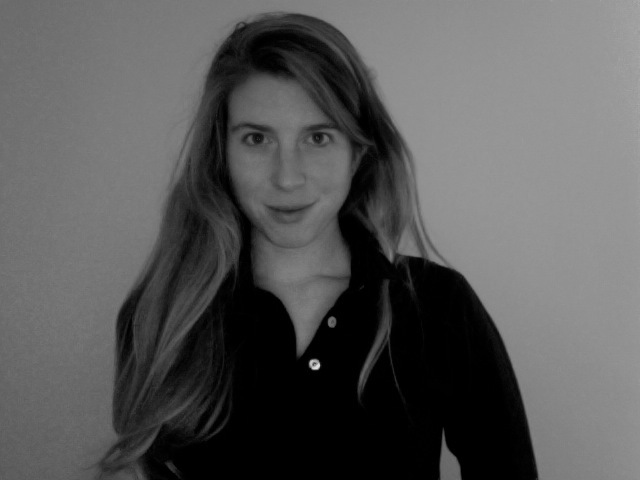 Cameron Finch is an MFA candidate in Writing & Publishing at Vermont College of Fine Arts, where she also serves as Managing Editor of the literary journal, Hunger Mountain. Her work appears in Entropy, Windmill, Midwestern Gothic, Across the Margin, Orange Quarterly, and elsewhere. She has taught writing seminars at 826michigan and at University of Michigan. Find out more at ccfinch.com, or follow her on Twitter @_ccfinch_.